Remember that sketch I did a while ago? The one for my own fic... Well, this is what I puddled in while I was away. Done using Copic Markers with finishing touches done in Photoshop. This picture means so much more to me having just read the fic that goes with it. I love the shading and lighting choices, especially the light reflecting off Ron's eyelashes. I also love the many colors in Ron's hair - it looks so real, as does his stubble. Hermione's fingers appear ink-stained, as you would expect for a scholar like her. It's brill! Fangirling your Ron more than evah!! And his eyelashes?? oh, I could just faint. Beautiful. I also particularly love the multi-colored lines and highlights in his hair. I love his light eyelashes. They are so wonderful. The coloring on this is amazing. I feel like I'm being sucked into a new world. I love the look in his eyes. Thanks! Have you read the books yet? That is just wonderful! I always adore your art. Ron all scruffy...*swoon* and R/Hr!! I would love to read the fic that goes along with this...where is it? Very cool. You should look into selling prints of your work. It's really easy. using http://www.photoaccess.com you can order a bunch of prints and sell them online or in ebay. Okay. the capitalist will shut up now. The problem with selling prints of fanart is that you run the risk of having Warner Bros come down all medieval on your arse. (because we all know how much what amounts to a cottage industry would eat into WBros profits! *rolls eyes*) It's my understanding though that they can't stop you selling the original painting. CG art which HAS to be printed... I don't know. Can I ask what color you used to achive those skin tones? It looks like some form of blue of brown but I can't pplace a brown that is that subtle. Skin colours - I always tend to stick with 'skin white' as the base colour, although with this pic I was working on cartridge paper (the original sketch in my visual diary), which carries the markers differently to the paper I usually work on. The 'skin white' came out much more orange on the cartridge paper I found and needed lots of toning down. 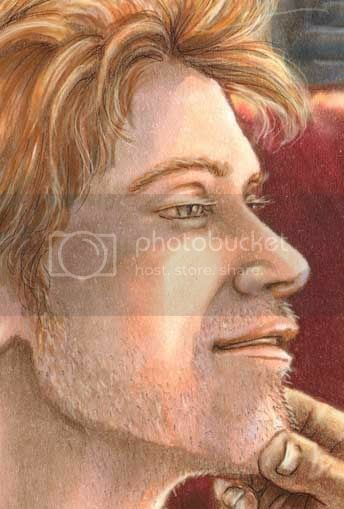 Other colours used - 'Clay, Blush, Barely Beige, Buttercup Yellow', and 'Caramel' was what I used for Ron's hair. And of course my favourite marker, which is the Colourless Blender. As for the fineness of Ron's hair, it's mostly Copic. The only photoshopping in his hair was the highlights - the 'white' strands of hair. The pic was A5 (5.5"x8"). That has to be the best picture of Ron-growing-up I've ever seen. 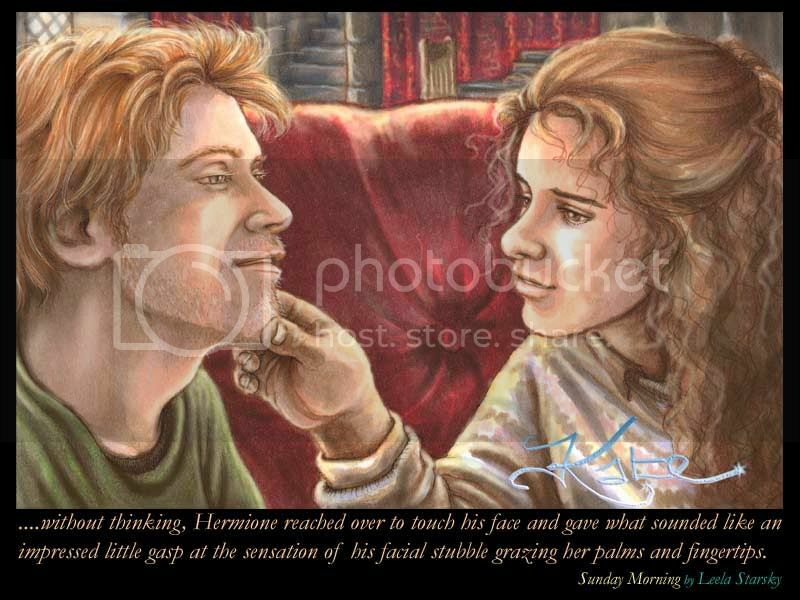 The composite picture is wonderful, with their expressions, the shading, the background details, but Ron just rocks. *takes mental snapshot to save forever* Very very nice! This is, like, totally Ron/Hermione = meant to be. And my GOD, woman, you are an amazing artist. The realism is pleasant and interactive and happy without being, based on the movie actors, or being, like. ugly. This is the opposite of ugly realism. This is the prettiest most exquisite realism, short of a photomanip. I really have to investigate into these...copic markers thingies. They fascinate me. 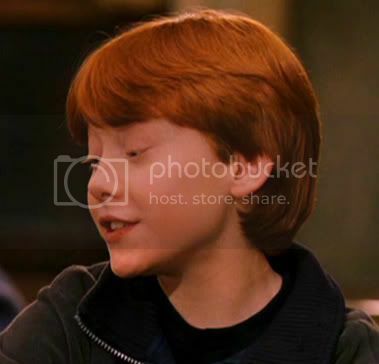 Ron's slight smirk. And his sideburns, oh GUHHHHHHH, you've destroyed me, you have. so, you'll take my commission right? make him real?? The Markers - you'll love I think. I really enjoy working with them. But don't forget the colourless blender! That IMO is the most important one to get (not that you'll see it without the others). With it you can bleed colours together and lose that hard, tell-tale edge that markers have. Can I just say that I have been admiring your art at SQ for months. A bunch of us from the Werewolf Registry have been fangurlishly drooling every time you post something new. Your Weasley family portrait is just amazing. My personal favorite is Neville which is just spot on! Your portraits are so in character. No one looks like they stepped out of a Gap ad. The warm earth tones are really excelent. Hope you don't mind if I friend you. Not at all. :~) *friends you back* Glad you're enjoying the art!